In my last post I argued for the need to enable face-to-face interactions, though I certainly didn’t mean to imply that we should require people to show up at the office every day. The big idea in the NetWork study is providing or enabling a choice of settings that support a breadth of needs. “Face-to-face” is one still-needed capability. Another is being able to move between several options for getting the work done. Whether or not an organization recognizes or even actively supports it, chances are really good that work is happening in places (virtual or physical) that don’t resemble the familiar assigned seats approach. Whether someone travels to customers, or sits in meetings all day, works from home or at their neighborhood Starbucks, they are working in places and spaces other than a workstation. In fact, they are working in places other than “the office”. This shift is partly driven by the nature of modern work and partly by personal preferences. The authors of our NetWork paper urge us to recognize, plan, and manage “the workplace” as an expansive network of settings – only some of which are under the control of influence of the organization. This implies that we need to provision workers – not just workplaces – to enable them to work anytime and anywhere. Perhaps this gentleman has grown too comfortable working in the car. If “mobility” is the ability to choose to be productive in spaces and places other than an assigned workstation or office, based on what best suits the task at hand, then NetWork is about developing, provisioning, and managing those spaces and places (including the virtual). Mobility requires much more than a real estate strategy du jour to save space: It can and should be one of the ways we enable worker choice and control. Since 2009 I’ve co-taught a class for CoreNet with Keith Perske of E-Business Strategies, as part of their MCR track, called “Enabling Mobility”. What’s become clear over the past three years is that mobility is one of those catchwords, like collaboration, that means many things to different people. Hoping to create a more nuanced definition, we started to distinguish between three types of mobility: work-at-home programs, “external” mobility, and “internal” mobility. For those organizations with field sales functions, home offices are not a new idea. Others, though, are expanding on that and sending other types of workers home, either part-time or full-time. Still others are taking an even broader approach; they’re provisioning workers to work anywhere (what we call “external” mobility) – whether that’s inside the office, at home, in public spaces (3rd places), or in co-working facilities. Like Richard Florida, I consider these options examples of 4th places – which differ from 3rd places because 3rd places aren’t specifically designed to support work. 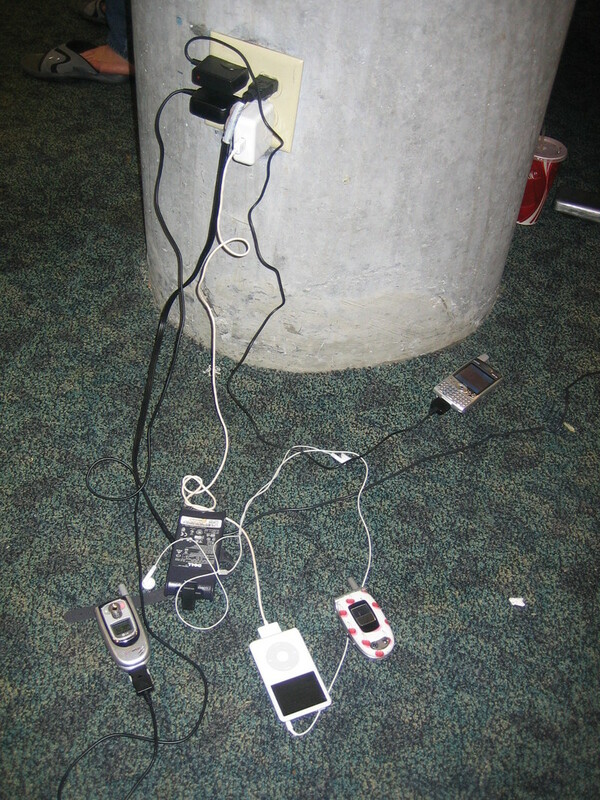 Have you ever tried to find an outlet at O’Hare? Or how often can you find chairs at Starbucks to be comfortable in for long hours of computer work? “Internal” mobility describes the phenomenon occurring in many organizations–providing a much greater variety of space types or settings that support a broad range of work practices, and enabling workers (with permission and technology, for example) to move between those settings to best support their particular mix of needs. Chances are really good that some combination of these three forms of mobility is happening inside most every organization – whether it’s formally or informally supported, or just tolerated under the radar. I’m just sayin’….